I've always done my research and opt for natural alternatives when possible but now having a baby I feel that I have an obligation to be a smarter consumer and ensure that I'm eliminating harmful chemicals and opting for natural solutions. There is so much information out there on topics such as essential oils and it is hard to sift through the marketing messages and know what you really need. I've tried a variety of brands and products and will share my favorites so you all can enjoy them too! Consider this your one stop shop for everything essential oils! Consult with your pediatrician before using ANYTHING. During my consultations I’ve learned diffusing oils is the safest option. I have a diffuser (less than $16) in my room and in the baby's nursery. We have them on all the time and it has become a natural part of our daily routine! Lavender is our favorite to keep in the babies room… he just loves it! Our favorite essential oil brand specifically for babies is OilogicCare. We love this brand because it is made specifically with kids, toddlers and babies in mind and I can always trust that what I am putting on my child’s skin and in the air he breathes is 100% natural and pure essential oils! Oilogic offers 26 different essential oils sourced from 13 different countries where the plants are indigenous. All of their products are Pediatrician and Dermatologist friendly, and… my favorite part… they are cruelty free! Another reason this brand stands out from the rest is their conscious effort towards making the essential oil mixtures safe for a babies skin. The oilogic blends are diluted properly within the blend and are added to moisturizing carrier oils to provide safe and effective solutions for babies and toddlers. Their products are MADE SAFE™ certified which means that the product is made from entirely safe ingredients. It is no wonder this brand is my go to for all baby safe health solutions! We order our Oilogic essential oils from their website but have also seen them at Target and Buy Buy Baby. Another point to consider when using essential oils for your baby is the use of hydrosols. My understanding is that Hydrosols are floral waters that are a byproduct of the distillation process when making an essential oil. They generally are picked up for using on children because they are safer and more mild than an essential oil. The best thing above this is that there are so many ways you can use them! You can make sprays, creams, lotions, a warm or cold compress, or place it in a diffuser. Adding holistic and sustainable health practices into our lives is so important… especially while raising young children. I hope this helps get you started and inspires you to integrate essential oils into your wellness practices in 2018! 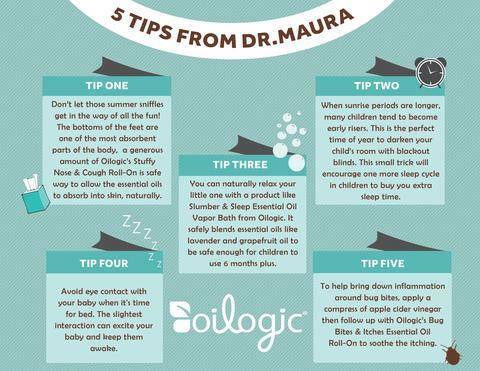 Would LOVE to hear if you've tried Oilogic or any other oils for your baby/kiddos and your insights?